The network-ready MICROLINE 8810n Impact Printer moves easily through a stack of multi-part continuous forms, report media and single sheets at a pace that will keep your business moving. You can feed them manually, by push tractor or optional cut sheet feeder—front and back. And you can rely on them to deliver crisp, near-letter quality output day in and day out, in the tradition of OKI Impact printers. Together, these features save paper and time, while enhancing your productivity. underlines, subscripts and superscripts, as well as double-high, double-wide letters. This impact printer is as uncomplicated as it is powerfu, versatile and durable. 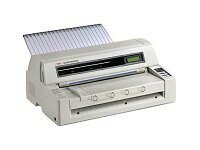 a backlit LCD display allowing you to quickly assess printer status, print mode, current paper path, and manual printhead gap selection.